The Bird Garden is located at 3203 route 114 in Edgett's Landing, New Brunswick. We manufacture unique bird feeders, houses, iron hangers and among other things make the best peanut butter suet ever. We also have a stall at the Moncton Market, Westmorland Street, (but we're closest to the Robinson Street entrance), Moncton, New Brunswick, Saturdays from 7 am - 2 pm. Plug your current location in the google maps at the bottom of each page for driving directions to our two locations. 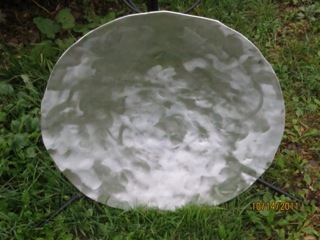 The bowl is made of hammered aluminum, it won't break in cold weather and never needs refinishing. It's extremely hard for me to get a picture of this bird bath. When freshly brushed it's very shiny and the photos always overexpose. Shown left the bowl on wrought iron stand, right, the stand alone and below, is the bowl standing up, pointed away from the sun, trying to show the texture. 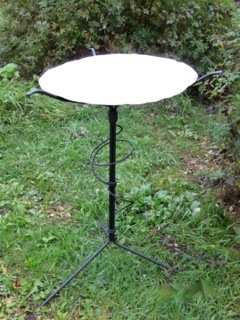 The stand is 4 feet high, the bowl is 2 feet in diameter. 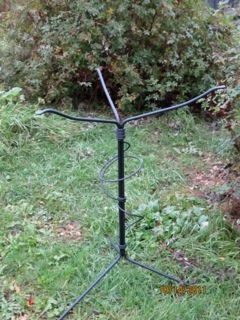 A great size, perfect for summer and with an added bird bath heater, great for winter too. Enter your current location for driving directions to our shops in Albert County and at the Moncton Market.